“Does a room full of sweaty people make you feel vulnerable? A comfort zone is a really, really beautiful place. But nothing ever grows in a comfort zone.” Woah. That’s Ciara T., member of the #Wheelpack, laying it down on getting uncomfortable. But this girl knows about walking into discomfort. She can remember sitting outside Wheelhouse for her first ride, in the early morning hours of December 16, 2016, trying to work up the courage to go through the doors. “I was much, much more than nervous,” she says, but some kind of magic took place as she road alongside Len and the #Wheelpack that morning. “I felt as though I was beaming with confidence and light as I exited the East location’s Vault. I felt exhilarated and alive… 45 minutes wasn’t enough for me, and I was hungry for more.” Little did she know she'd soon be crushing doubles on her days off. Talk about inspiring! Maybe you can relate to the trepidation of those first few rides... not knowing what to expect or where you'd fit in. Ciara’s journey has been made up of a whole lot of hard work and commitment. And vulnerability. And openness. Take a look at Ciara’s Instagram (@ciaratrapp) and you can see that this fun-loving gal loves her some nature, people, adventure… and vulnerability. 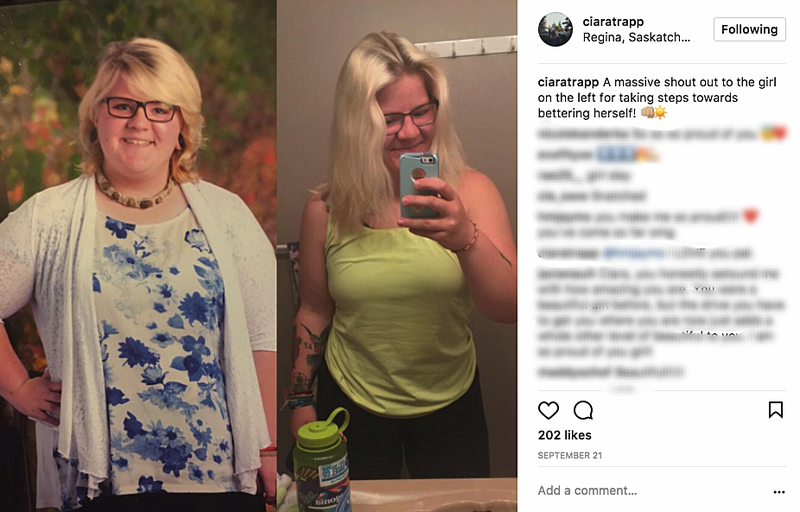 With positivity and bravery about her journey to health and fitness, Ciara is one inspiring girl-next-door. This WHCC blog series is all about celebrating the incredible people who walk through our doors every day. Today we celebrate Ciara. Check out the amazing perspective in Ciara's self-talk below. And we get it - sometimes it’s hard to believe that you can really grow and change, and that your presence in the #pack makes a difference. With 30+ bodies sweating and working, it’s easy to underestimate individual effort in the midst of the collective, when all of that sweat and effort come together. We think Ciara’s story is pretty rad for speaking right into that: “You’d be surprised how easy it is to feel almost at home with a room of 30 strangers, all working towards different goals. We all start off as strangers, but easily, it feels more like family.” Remember where she started from... unsure of that first ride and how it would go. You know the rest! Think how much you have grown since that first time you walked through the doors! Many of you may be navigating the intensity of school and assignments, perhaps trying to find time for exercise despite the demands of the day. To the students in our midst, Ciara had some thoughts from her own experience: "You could be holding up a part-time job, balancing all of your classes, worrying about a social life and trying to find a balance of sleep that doesn’t leave you groggy in the morning. Finding 45 minutes to give back to your mind and body is so important. You will thank yourself for giving back to yourself through embracing what your body is capable of. Incorporation of physical activity into your weekly routine truly does change dynamic, and things, like assignments, don’t feel so stressful." You’re that community, Ciara. So is each one of you who’s ever climbed on, clipped in, and held on for the ride. We love seeing people set and crush goals, grow, and bring people along with them as they go. Your story is different than Ciara’s, but it’s exactly what it’s supposed to be. The vault is more than just a space, it’s all the people who bring their energy and passion that make it what it is. When’s your next ride, #Wheelpack? And hey, Ciara T…. You’re awesome!